The exhibition of 34 images is now hanging on the Walls in the Yates gallery. 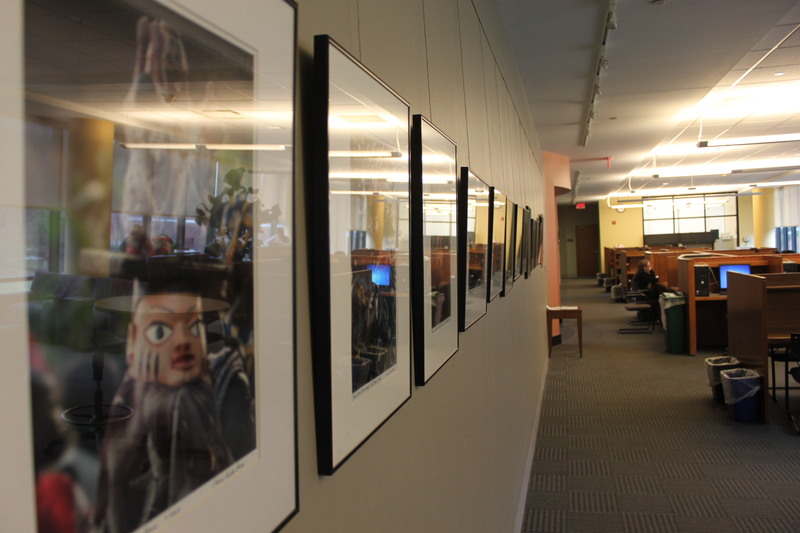 I invite you if you can to visit the Siena College Library to view the work. The invitation and information concerning the show will follow. We had –according to my husband Frank’s count– we had almost 80 people attend. The gallery director, Sergio Sericolo who was a pleasure to work with, noted that they had never had as many people to an opening. So thank you all for coming. The long expansive wall of photographs. Unfortunately I did not have anyone taking pictures of the reception and gallery talk. I am delighted that I have a SUNY photo journalism class coming for a walk through and a Siena class concerning Arts and activism also coming for a gallery walk through. If you would also like to bring a group for a walk through please contact me and I will help make the necessary arrangements. I do hope that many of you will make it to the exhibit and I would love to hear your comments. I am very excited about the new work and can see the growth that I have made since my last trip to West Africa. It is a good feeling when I can say that about my own work particularly when I am the most critical viewer. Many of you have mentioned that you are waiting to see some of my new work from the trip to West Africa. I will give a general overview of the trip in my next post for now I would like to share with you a current exhibit I set up just before I left for West Africa and will continue into the beginning of November. New cafe area at the library showing the exhibit. Soraya speaking about the plight of the Afghan woman. 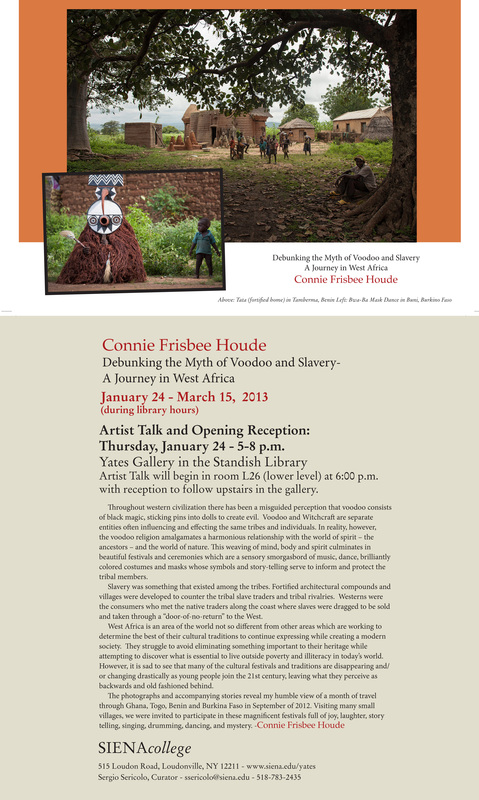 Thursday, November 8 Noon – 12:50 p.m.
Connie Frisbee Houde, a photojournalist who has traveled deep into the heart of Afghanistan, will share images that give voice to Afghan women. In her audiovisual presentation will depict the realities of Afghan life as the women attempt to keep alive their autonomy, culture and community. The poignant beauty of Afghanistan and the strength of its own women will be evident. I thought I would include this shot taken in France while I was traveling with a colleague for work to let you all know that Afghanistan is not the only place I travel. 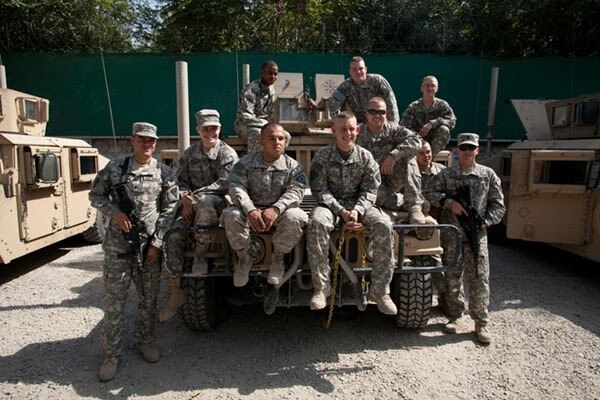 That said I will be returning Monday to Afghanistan for a month. I have been writing lately of our efforts to build a well in Mir Taqi Shah, a village south of Kabul. Now that it is up and operational [see previous blog entry] I will be in the village with Fahima Vorgetts (Afghan Women’s Fund) in late August to see first hand the effects of this project. 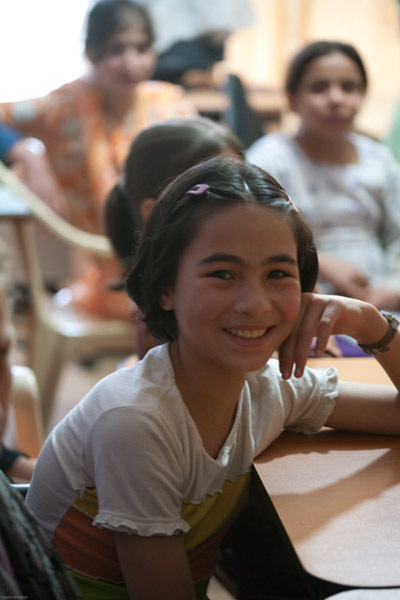 I will have the privilege and honor of visiting some of Fahima’s other projects around Kabul. Traveling half way around the world I wanted to have a bit more time in Afghanistan so I contacted my long time friends Tom and Libby Little who have been working in Afghanistan for the past 30 years (National Organization of Ophthalmic Rehabilitation – see previous entries and photo galleries). Before I heard back from Tom and the day before my birthday I received an amazing offer from Diana Tacey, executive director of ChildLight Foundation for Afghan Children www.childlightfoundation.org. I have never met Diana however we have corresponded and talked on the phone. We discovered we are kindred spirits who care deeply for the Afghan people wanting to lend a hand assisting them as they work to recover from years of continuing war which has thrust them in to and keep them in poverty in many places across the country. She invited me to travel with her in the beginning of August visiting women’s prisons around the country. I will be adding to this blog from on the road when it is possible to do so. If you would like to follow our travels please click the “About Connie” in the tool bar at the top of this page, scroll to the bottom and check the box “subscribe by email to this post”. I do hope that many of you will join me on this journey. 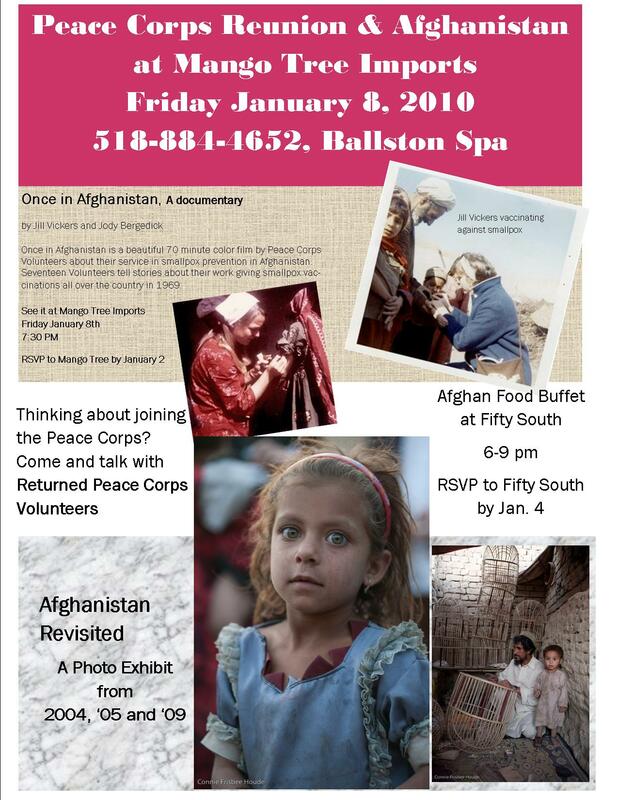 My first exhibition of images from the September/October 2009 journey to Afghanistan is currently at Mango Tree Imports, 2124A Rt 50, Ballston Spa, New York #518-884-4652 until January 31st. There will be a special event January 8th, 2010. Here are two of the images that are featured in the exhibit. The first is a panoramic taken from the roof of the house of an Afghan family who introduced us to a variety of Afghan public officials. View of Kabul from Asad and Noorai’s roof. 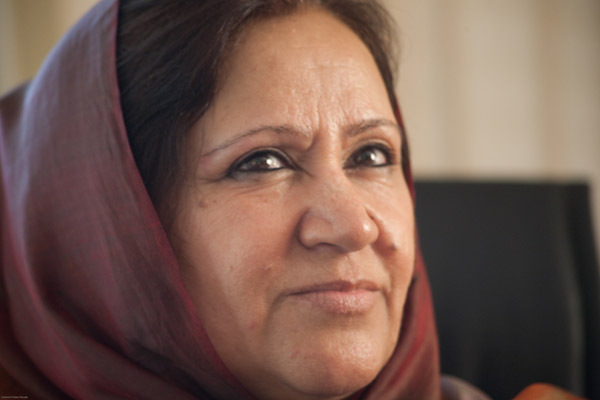 One of the most moving interviews we had was with Dr. Soraya Sobhrang, Commissioner for Women’s Rights of the Afghan Independent Human Rights Commission. 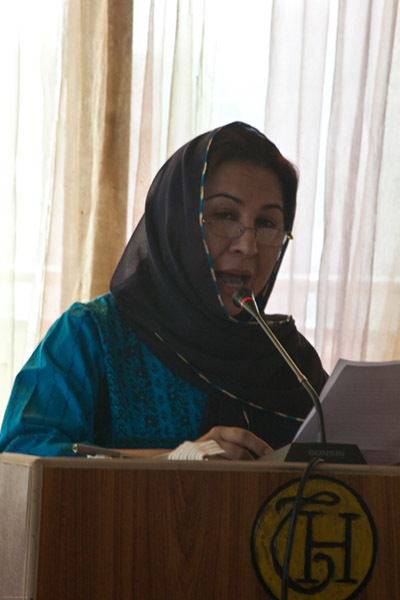 She is an OBGYN who fled Afghanistan during the Taliban rule. 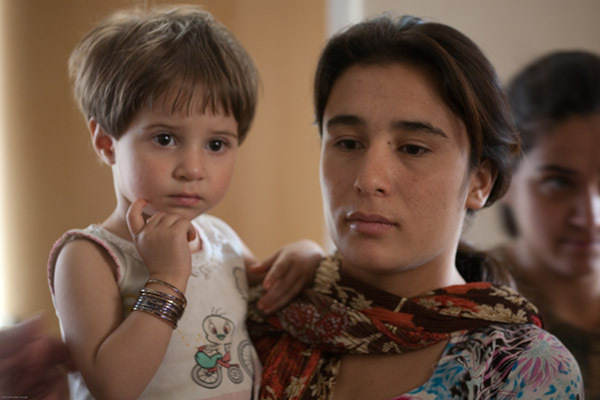 She has chosen to return to Afghanistan to help her native people, particularly women, at tremendous risk for her own safety. She has received death threats because of her activities. To learn more of my current conditions in Afghanistan and my experiences please contact me to speak to your group or to present an exhibition of my images. I also am very honored to have received and honorable mention for my submission for the members show at the Albany Center Gallery juried by Tammas Groft, Deputy Director of Collecti0ns and Exhibitions of the Albany Institute of History and Art. 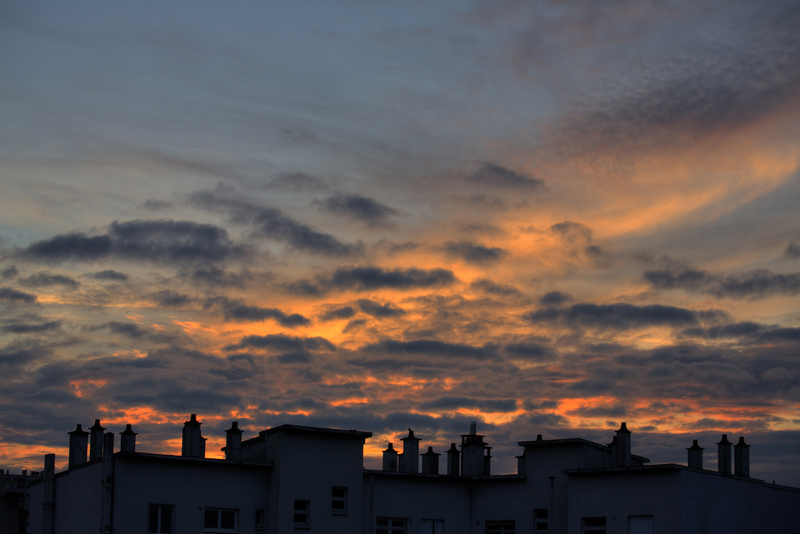 The photograph is one of my first attempts at High Dynamic Range Photography. Believe it or not it is of a friends compound in Kabul, Afghanistan. When I learn how to convert this type of image to a format that I can up load I will include it here. One of or members wanted to buy musical instruments for her daughter so Asad and Noorai, our Afghan friends who Jodie from CodePink knew from their time in the Bay area, took her to the musicians street. One man who made rebab’s payed for us. 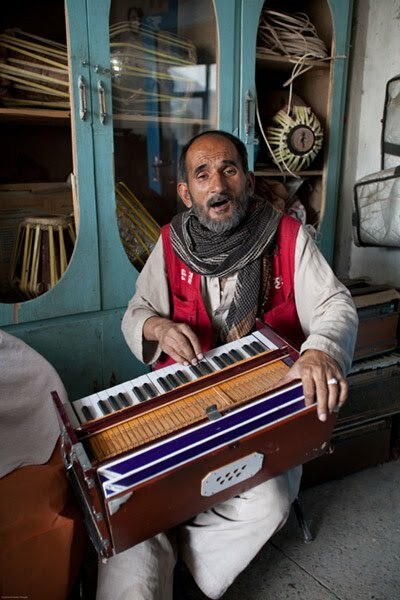 The high light was the “older” gentleman of approximately 40 years started to sing a Pushtu song of the love of Afghanistan. 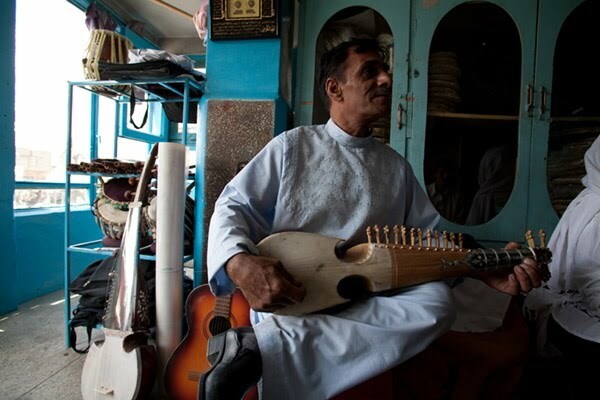 Having lived in Kabul all his life in a family that followed the musical tradition of father and mother teaching their children who then carried the information to the next generation. 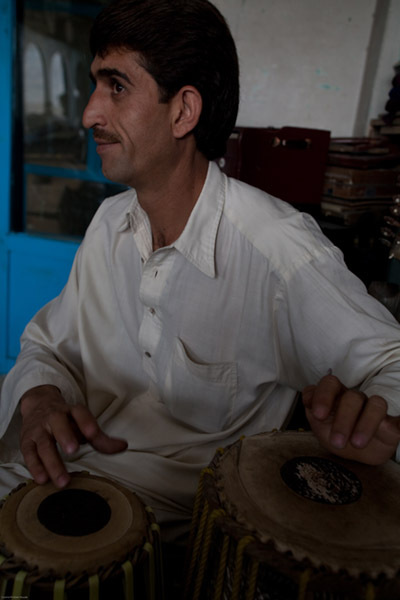 During the Taliban time they buried their instruments in the ground in the basement of their house. If they had been discovered they would have been severely beaten or killed. We all felt his love and our hearts melted as we too found a peaceful, joyous, beautiful county from the tone and tenor of his song. Media Benjamin and Jodie Evans stand on either side of to very brave and courageous women who spoke of the shia family law and the protest they arranged to get the law changed. Telling of how empowered – as well as terrified – they felt as 200 to 250 brave women faced off hundreds of very angry men and women. They continue their work knowing that they have the support of many and the revolution once again is beginning. We keep busy almost every minute with meetings of all types. One of the highlights a couple of days ago was listening to Soraya director of women’s rights in the Afghanistan Independent Human Rights Commission. She was extremely energetic with a sparkle in her eye. She spoke of the work they did to protest and successfully change the Siai (forgive my incorrect spelling) family law. 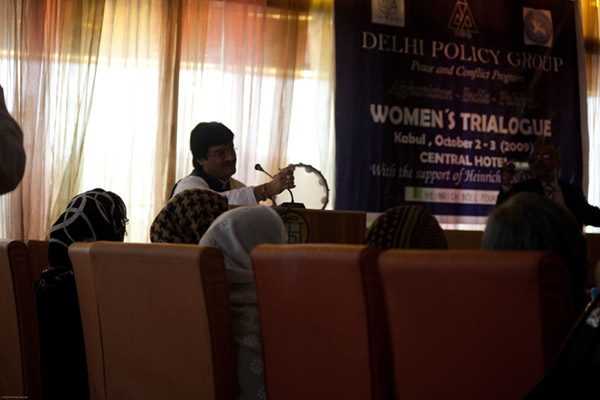 She invited us to attend a women’s conference Afghanistan – India – Pakistan Trialogue for Peace that just happens to be while we are here. So yesterday we attended the opening and met with many different people during a tea break and lunch. The day before yesterday we visited Shinkai Zahine Karokhail, a member of the Afghan National Assembly, in her home experiencing her dedication to women using her position to prevent unjust laws from passing for women and to create a better position for women. It surprises me just how much access we have had to these people. Must get to breakfast to give me energy for the days activities.